As we enter 2015 with all sorts in interesting energies flying about, and all sorts of ideas of where we’re headed in this next year, it’s nice to take the time to celebrate accomplishments we’ve made over the last year. 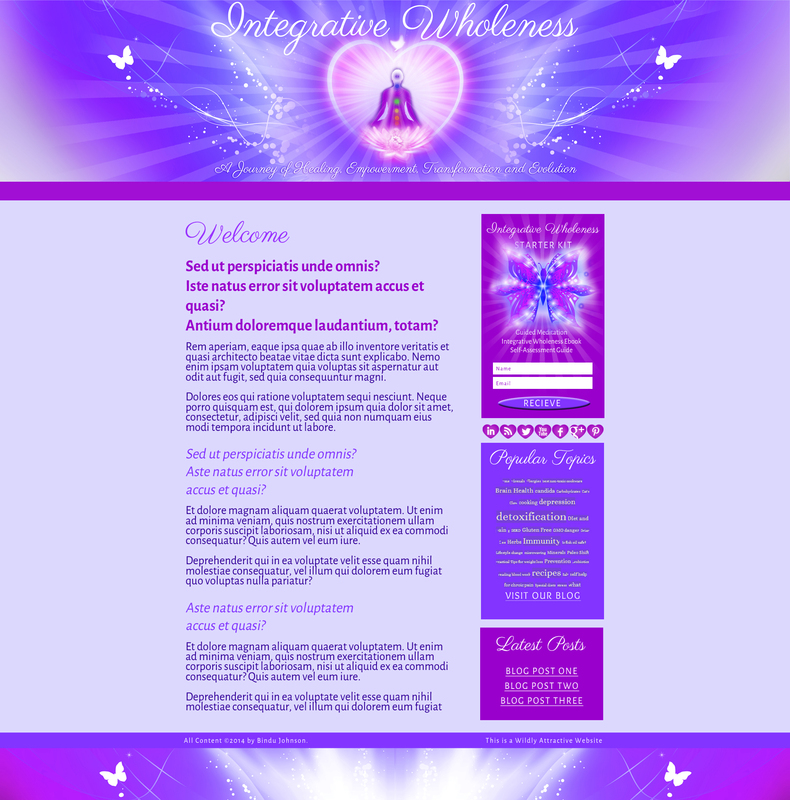 Toward that aim I am presenting the Magical Marketing 2014 Spiritual Website Design Retrospective! The website designs below are a good representative of the several dozen custom designs I created over the last year for incredible, creative, brave women who are out there transforming the world through their spiritually inspired gifts. Each of these designs represented here are “Wildly Attractive Websites” created by me in collaboration with my clients. I develop the visuals whilie using screen share with my clients so they can watch and comment as I do my magic in Photoshop. The main visual element to the Wildly Attractive Website is what I call an Alchemical Banner Design. When I collaboratively create these, my clients tell me how the colors, elements, and styles of the graphics feel to them, and only when they feel it is aligned do we move forward. The result is a resonant design that feels like the client and inspires those divinely aligned prospects to connect with them. That is why the visual resonance of each design is distinct rather than being only a representative of my artistic style. Some of the Themes are in production so you are seeing the “Theme Design Comprehensive” which is why the text is dummy text, etc. This is your ‘bird’s eye view’ into the process of designing a website. 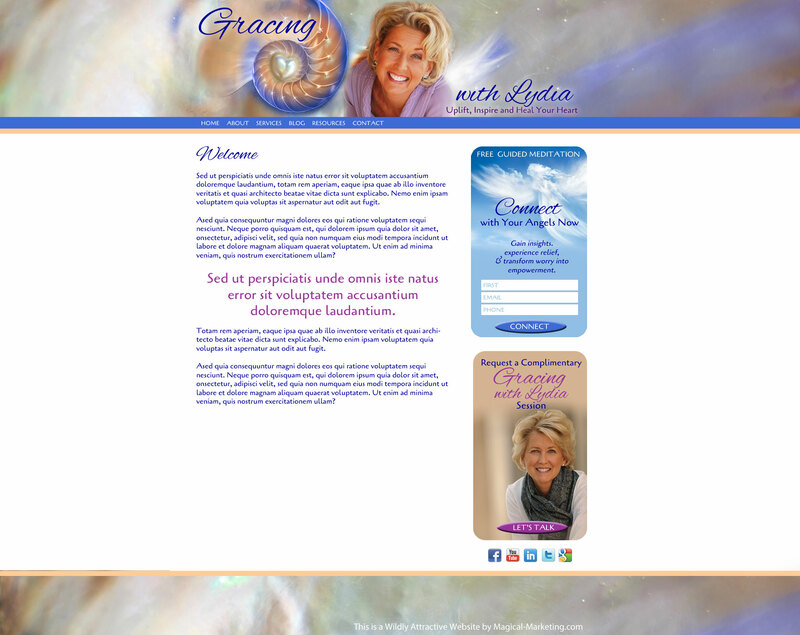 I hope you enjoy this spiritual website design retrospective. Click on one of the thumbnails below to start the slide show. Elizabeth Gibbons is the Bejeweled Baroness, inspiring artist and teacher at the Divine School of Glitteracy. Of course her theme needed to include her original artwork, embellishments and lots of glitter! 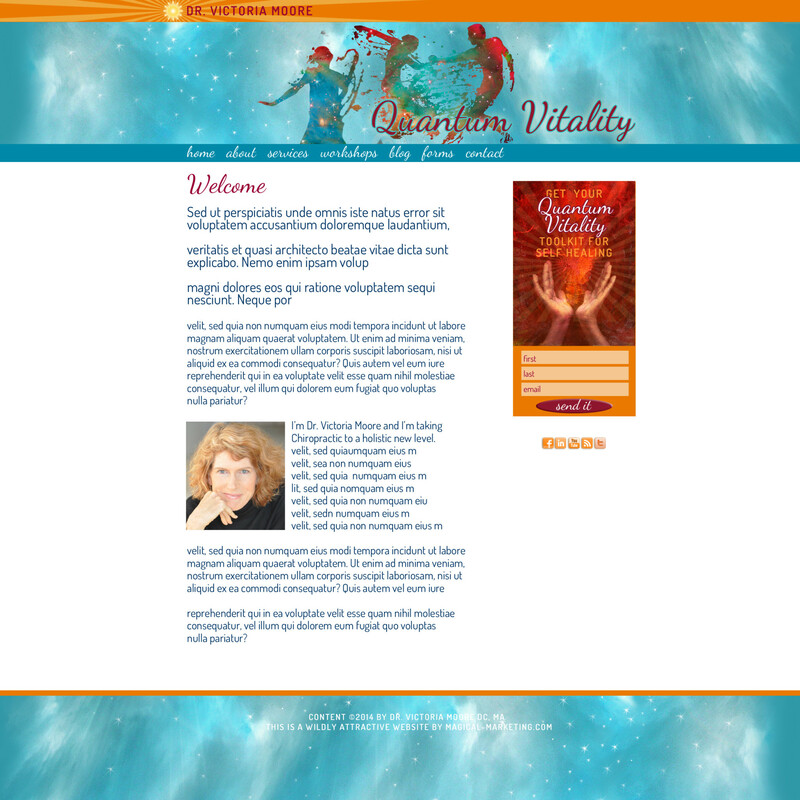 This theme design is created to represent Dr. Vic's out-of-the-box services for Quantum Vitality. Action, movement, power, creativity, light, fun are all part of this original brand. This theme is designed to represent the experience of Nadine's clients who "Flourish After Betrayal" as their pain transforms into beauty. Freedom, transformation, love, and groundedness are part of this unique brand. 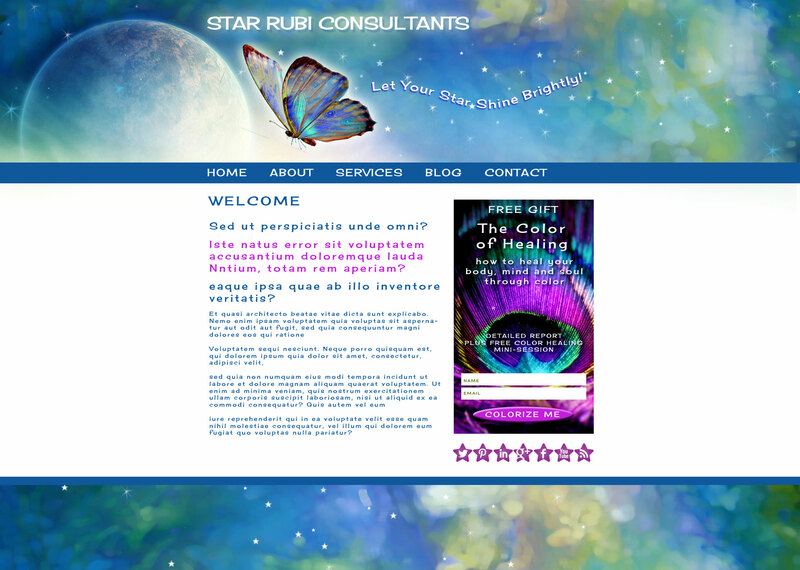 This theme is created to inspire the feeling of "Let Your Star Shine Brightly." Valerie G. uses color healing and other creative body/mind/soul methodologies to help people truly shine their unique gifts to the world. 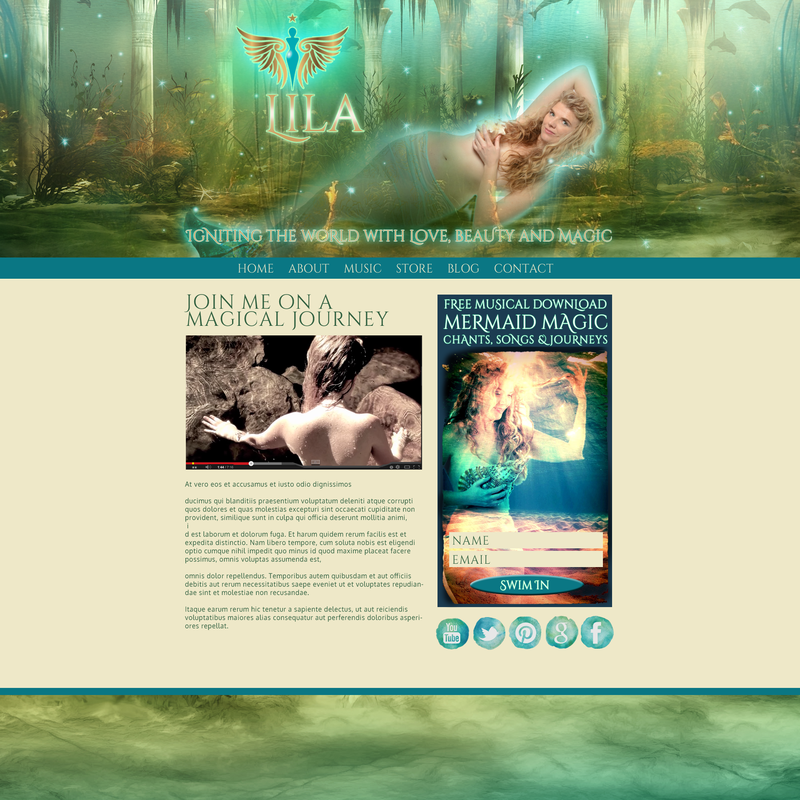 Lila is a beautiful musician and singer who is "Igniting the World with Love, Beauty and Magic." Lila is revealing her "Mermaid Magic" though this theme. 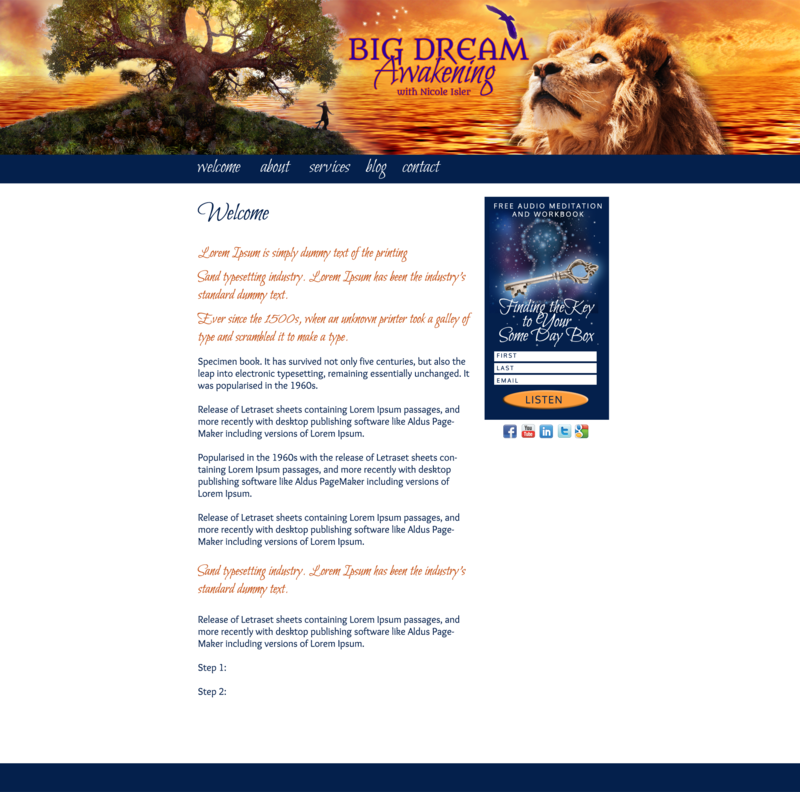 The feeling of "Aslan" is coming powerfully through this new design for "Big Dream Awakening" Nicole Isler is helping folks to find the key to their "Some Day Box" that is, stop putting off your dreams for tomorrow. We had so much fun creating this design! 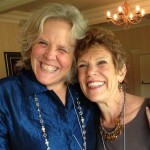 Barbara Hoffer is a bright shining light in the world of her clients, she is "Your Vitality Buddy!" 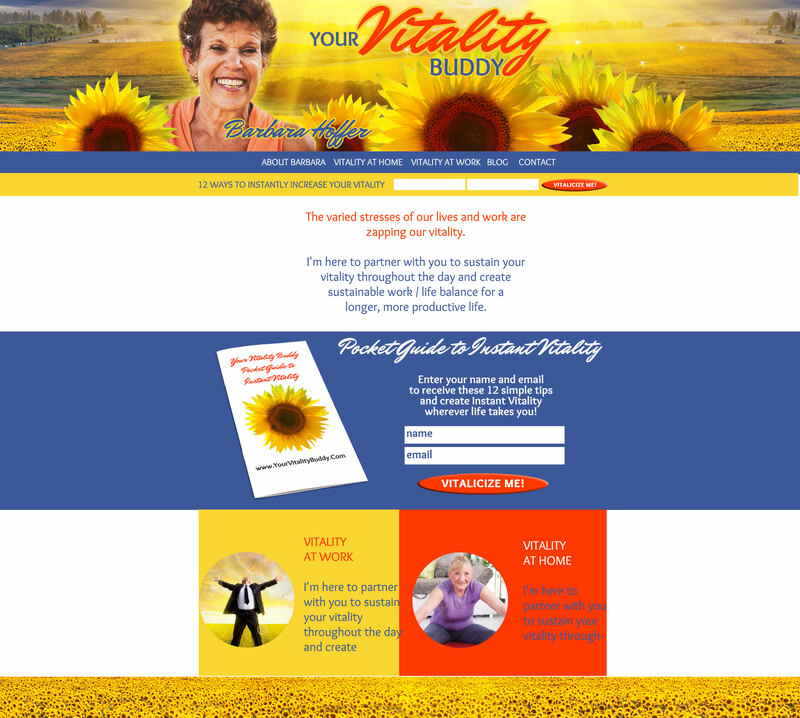 This theme is designed to feel uplifting, fun, and vibrant, just like Barbara! The modules are simple, short, to the point, and inspiring. 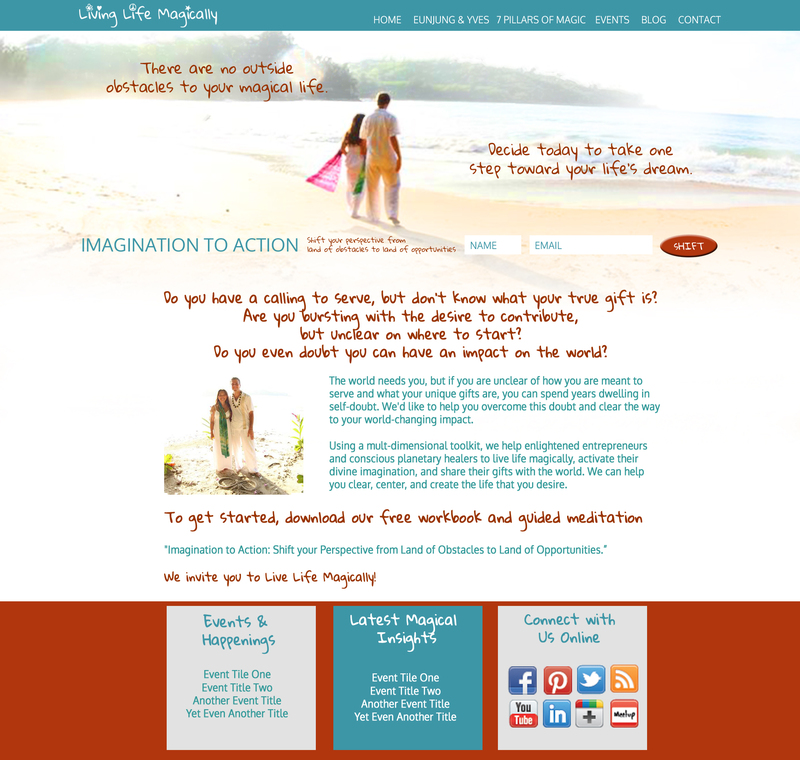 This landing page design was created for the Magical Marketing Conscious Business Holiday Giveaway. It's designed with clear, brief modules that guide action and provide the minimal information required to inspire interaction. 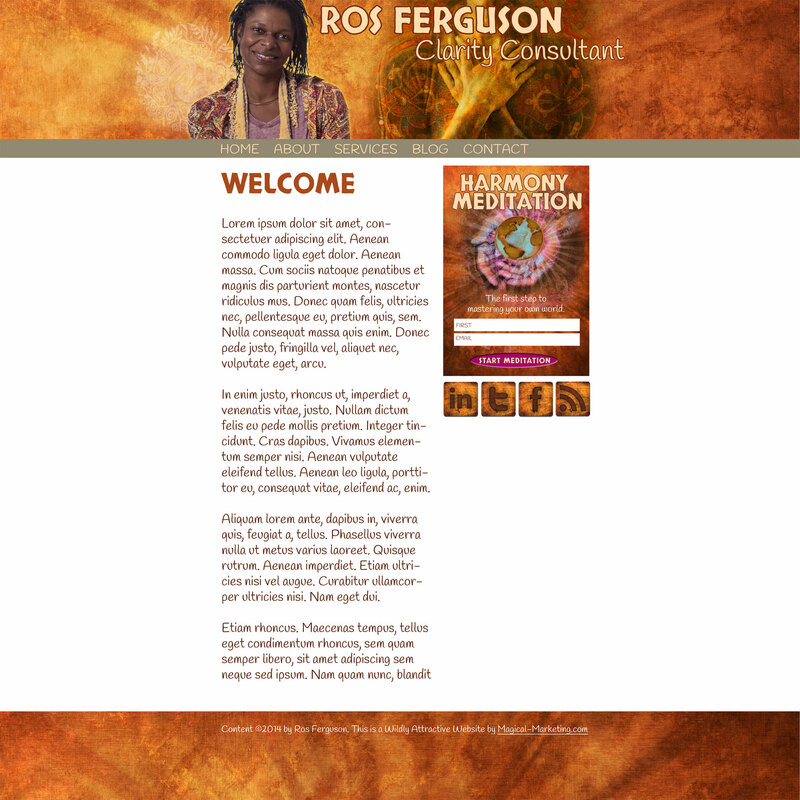 This new website design for Magical Marketing in 2015 includes a clearer structure, less copy, and attractive modules that guide the desired action on the site. Bindu is on a journey of healing, empowerment, transformation and evolution, and she's sharing her brilliance to those on the same path. We wanted to communicate the high vibration, the transformation, and the balance of her work through this colorful design. This theme is designed to include movement, magic, spirituality, and nature, all the elements that Rachel brings into her "Natural Brilliance" work. Eunjung and Yves are lovers who travel the world spreading magic. For their theme design we used images that evoke the light of their love (the photos were taken on their wedding day in Hawaii) and the magic we are all here to create. 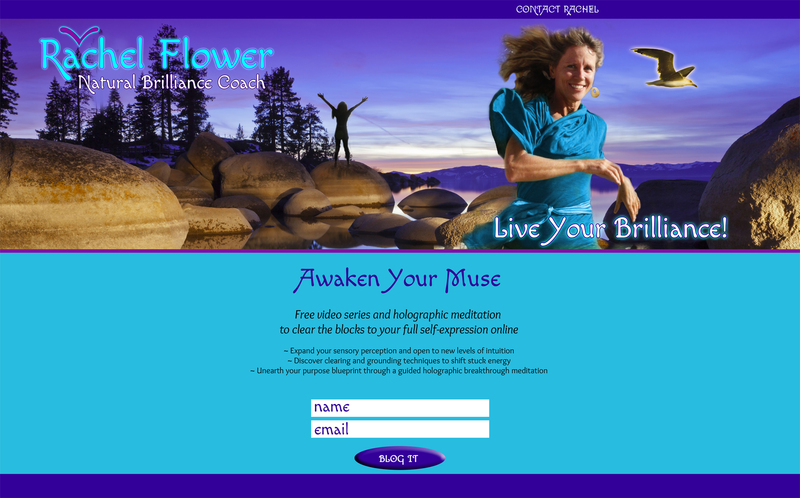 If you know it’s time to truly express your gifts, your offerings, your personality, even your Soul, through your website I invite you to apply for a Magical Strategy Session. Together we will plan your next steps and discuss how Magical Marketing can assist you to attract your Soul Tribe online. I would recommend finding a professional to help you rather than trying to force yourself to become technical and then learning a very technical process. Rather, focus on what you do best and thrive that way while allowing someone else to provide the services. If you would like to explore how Magical Marketing can help you with your site, apply for a Magical Strategy Session at http://www.magicalstrategysession.com. 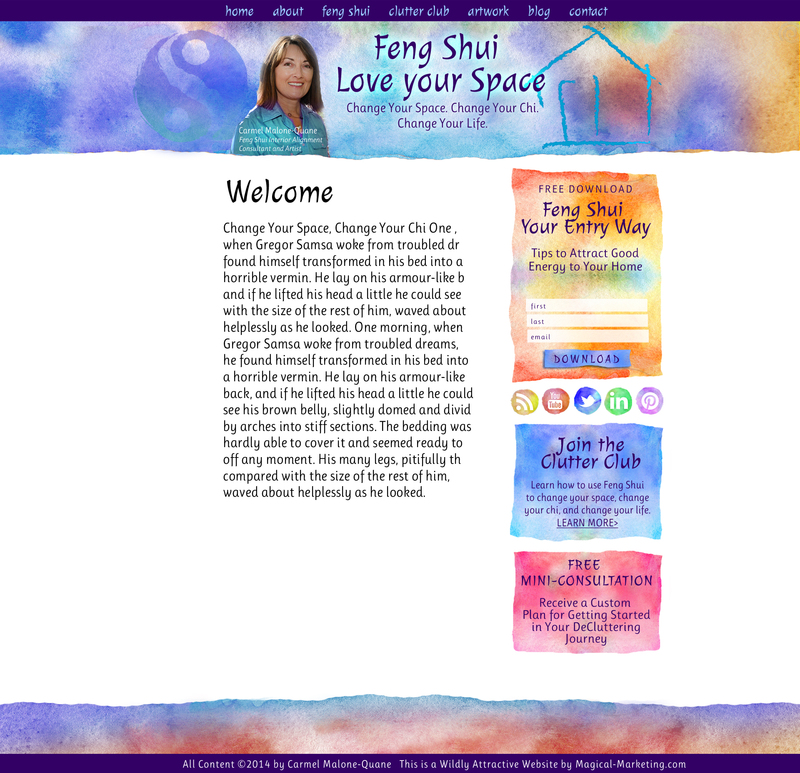 Thanks for finally writing about >2014 Spiritual Website Design Retrospective <Loved it! All I can say is, you are amazing, Julia! Co-creating my own artwork with you was mind-blowing and satisfying at the same time. 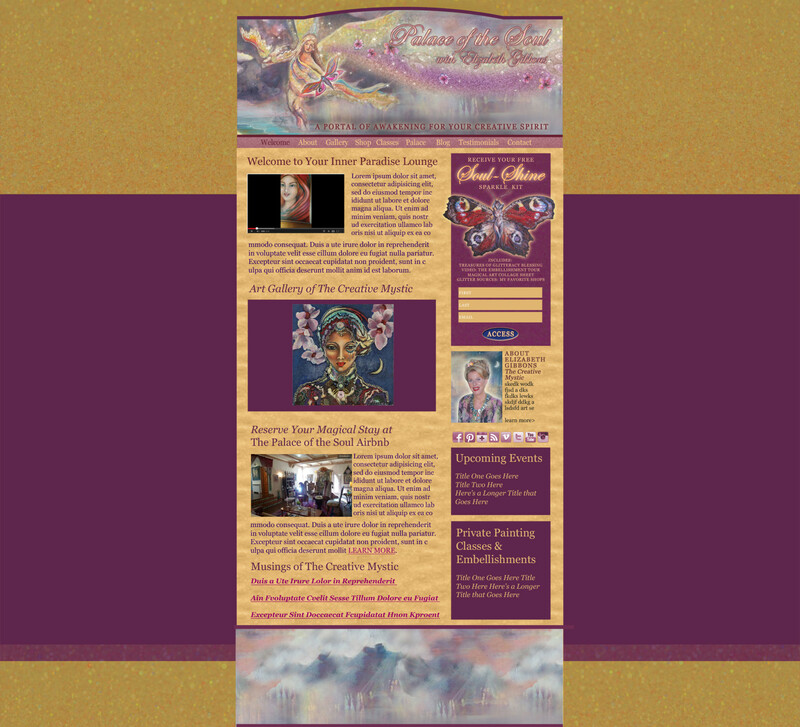 I’m looking forward to the imminent completion and posting of the final product, my website online–delayed, I think, by my having to ‘grow into’ the vision we designed. I love looking at all the other incredibly beautiful and expressive art you’ve created with other people. I have to say, however, I do like mine the best! Congratulations on your one-woman-with-partners show, and thank you! Julia the websites are absolutely beautiful. Words cannot describe them. Thanks Helena, I appreciate your kind comments. Hey I am so excited I found your website, I really found you by accident, while I was searching on Yahoo for something else, I am here now and would just like to say kudos for a tremendous post and a all round exciting blog (I also love the theme/design), Please do keep up the fantastic work. Hi Dotty, thanks for your kind note. I’d love for you to come to our webinar this week. 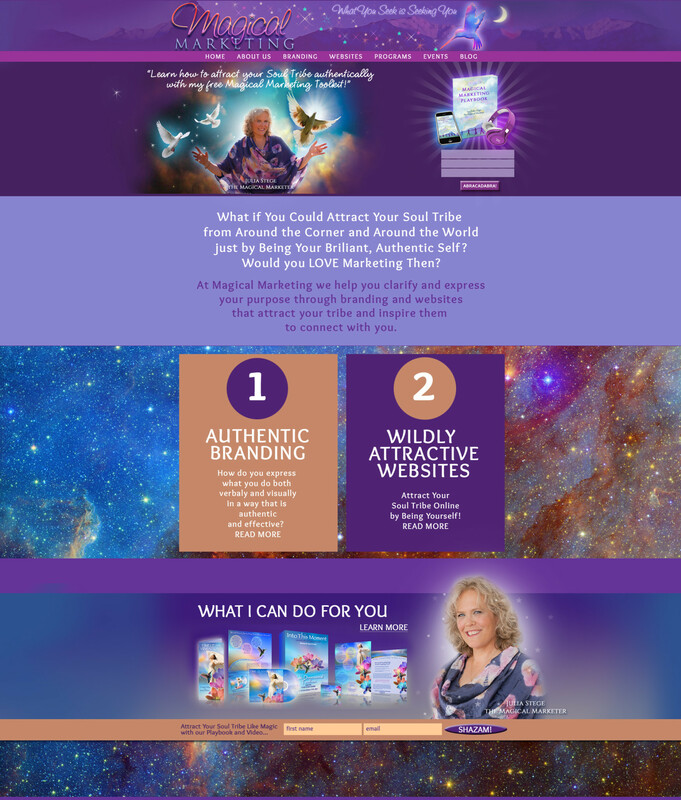 You can access that by downloading my Magical Website Checklist at http://www.magicalwebsitechecklist.com and it will guide you to the webinar page. See you soon! Absolutely beautiful Julia. You have the gift to know exactly how to portray and display your clients talents and services. You definitely have your finger on the spiritual pulse for light workers and conveying their loving and genuine message. Thanks Wendy, I appreciate your kind comments. of really take helpful facts concerning my study and knowledge. Very beautiful work which truly shows your spirit and the spirit of your clients. I’m impressed! Thank you Karen! We aim to inspire! You are so right, it was so much fun creating my site! It was magical how it all came together so effortlessly. When you put all the artwork together, I felt like I had just finished a giant puzzle and all the pieces fit perfectly. 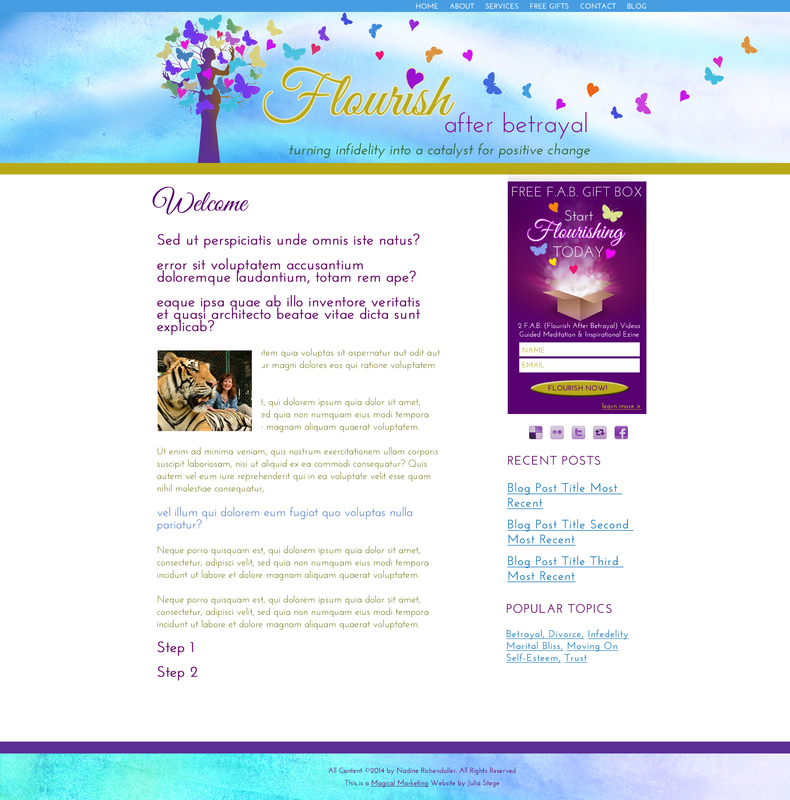 My site is not even complete yet and already I’m attracting my perfect tribe! I’ve had a string of new clients and I know it’s from the work we did together. Working with you on website and brand message has also inspired my brand new program and the services I offer. I better understand who I am as a healer, what I do, how I help my clients and best of all, who I help! It feels amazing! Thank you Julia! So glad you love the site and it’s getting you results already, pre-launch. Now THAT’s magical!